Etsy is stuffed with jewelry made from bits and pieces: stray stones, findings, watch parts, found objects. Some if it is awkward, a marriage that should never have happened. But you can find treasures from vendors who display a refined sense of design and solid technique. In their hands, assembled pieces sing. Though the approach appeals to the recycler, to earn a place in the Passage, assemblages need to be pleasing enough to stand on their own. Here are some that made the cut. 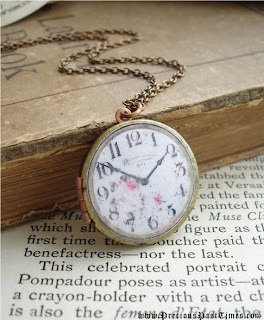 Vintage '70s brass locket on chain, with a decoupaged clock on the front, sprinkled with soft roses. Whimsy, romance and repurposing, who can resist? 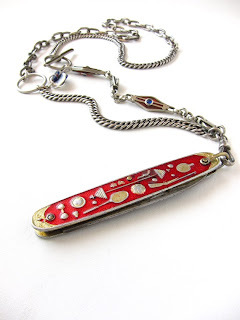 Price, $34.50 from PreciousPastimes. Charms that began life as earrings! 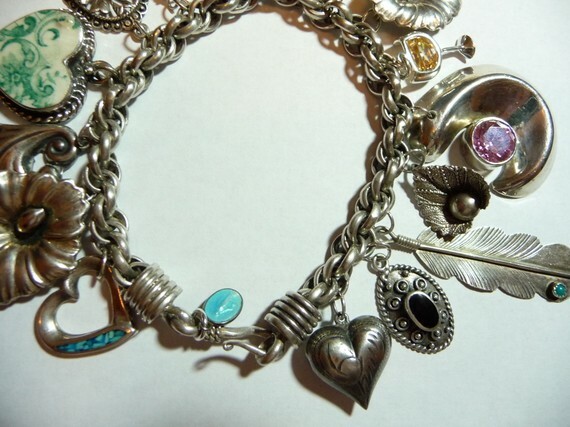 A vintage silver charm bracelet made of charms and vintage earrings. What a great idea: remove the screw back and earring becomes charm. (And if you lose an earring, here's a new home for the remaining one.) On a heavy 8-inch silver bracelet; price, $300 from apurplepalm. This necklace is called "The Instant Antidepressant" and it certainly made me smile. A triple strand of champagne, brown and taupe freshwater pearls and crystal rondelles, with a vintage sterling and rose gold medal (ca. 1926) for a pendant. Price, $175 from Victory Jewelry Design. A sterling silver 26-inch chain with a vintage silver watch fob makes a classic, timeless pendant. 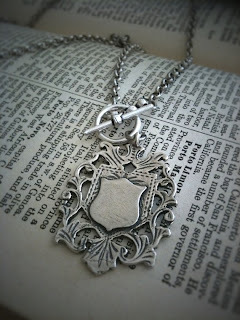 Price, $45 from BlackSparrowJewelry. MilleniumAssembly make magical marriages of old elements; I especially like this Game On necklace, with nickel-silver chain with red and blue glass inlay and an old enameled pocket knife decorated with sports symbols. Everything is distressed, a story as well as a piece. Price, $145. 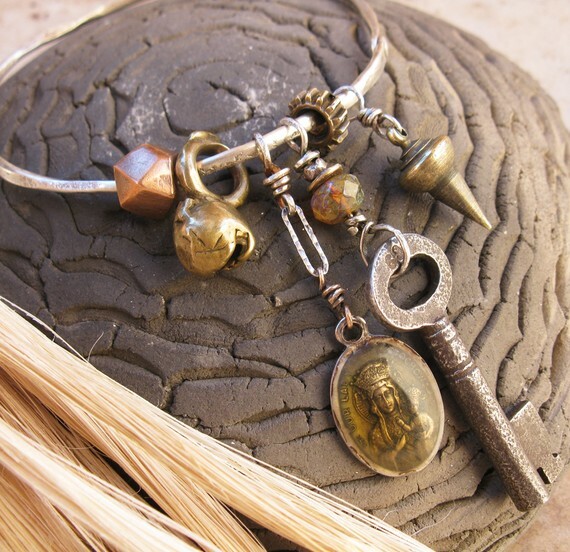 A hammered silver bangle-style charm bracelet with antique silver skeleton key, Madonna, Thai silver bead, Indian dancer's bell... and a plumb bob, why not? Price, $114 from deserttalismans. These pieces are one of a kind, so if it's is sold, don't weep. 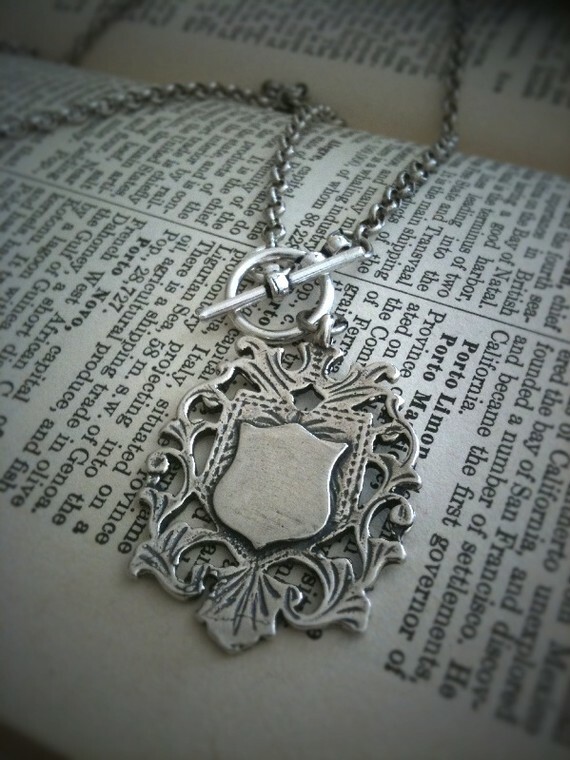 Something similar is often available, and most designers are happy to receive commissions. You could supply a few of your own fragments to incorporate into the design. Crafted from odd elements, the pieces carry more character than pristine jewelry-counter purchases. If the designer has the eye and the hands, you've found an idiosyncratic treasure. I'm always amazed at the pieces you track down, Duchesse! That pearl and pendant necklace is wonderful, though I also love the charm bracelet (and the idea of using earrings as charms). Love these - it's so much more fun to wear something one of a kind. Thanks for the etsy reminder too; it's an easy way to connect with and support some amazingly creative people. Love these pieces. Patina and history. current shopping challenge. My daughter is graduating from college in one month and I'm coming up empty handed(and headed). She has some grey/blue pearls and we gave her an engraved sterling sliver bracelet for her high school graduation. Any ideas would be appreciated. Cash is what is most needed but something to mark the day, too. Pseu: Hah, you spotted my fave, the pearl & pendant. Ver-ry nice! Vivienne: Yes, I've had great communication from the artisans. rb: Well...that makes two of us! Or this: www.twistonline.com, search Me & Ro Medium paisley hoops. A watch? Much more polished if she's going to work than pulling out a phone. 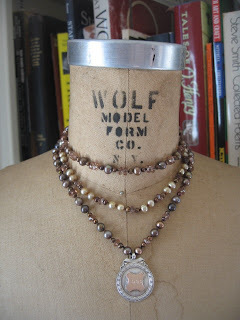 I too have been trawling Etsy for people who rework jewelry. It's a great system, leading to some wonderful pieces. I plan to start discussion with my local jeweler too. Eventually, eventually. LPC: I've culled a lot of haphazard dreck to present these. Some are true artists and some are clearly flogging a cat's breakfast of "junque". But it's fun to hunt! I must have missed Pyrrah the first time around. Interesting. and thank you for the Congradulations. The four year drifted by quickly(not being in the day to day trenches)and the results make me very very happy.